I’m generally not inclined to speak ill of the recently dead. I also want to keep my distance from the reflexively venomous commentary I’ve seen from some, though certainly not all, conservative bloggers and pundits. Finally, I didn’t think there was anything new worth saying about Chappaquiddick, 40 years later. So although I’ve been annoyed by some of the excessive adulation, I didn’t plan to write anything about the passage of Ted Kennedy. Then I read, in James Taranto’s Best of the Web Today, that a sympathetic biographer told a radio interviewer this week that Kennedy’s famous sense of humor extended to Chappaquiddick jokes. Ted Kennedy was one of the most influential Senators in history, and though I disagreed with him on many issues, I recognize he was a passionate and effective advocate for his causes. My Christian faith teaches me to believe in forgiveness and redemption, and his career can be seen as an effort to atone for his appalling actions that night. But surely true remorse — or even just common decency — would preclude making jokes about an incident where he put his political career ahead of a young woman’s life. If justice had been served, his path to redemption would have included a stay in prison. 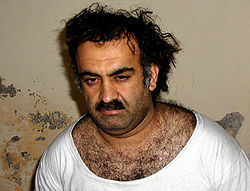 When he joked about it, he mocked justice. 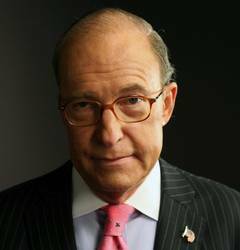 Requiescat in pace, Edward M. Kennedy. 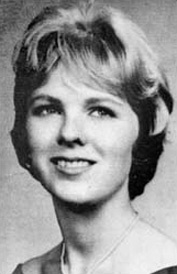 Requiescat in pace, Mary Jo Kopechne. She would be 69 years old. When David Goldhill’s father died from an infection he contracted in the hospital, Goldhill went looking for someone to blame. But my dad’s doctors weren’t incompetent—on the contrary, his hospital physicians were smart, thoughtful, and hard-working. Nor is he dead because of indifferent nursing—without exception, his nurses were dedicated and compassionate. 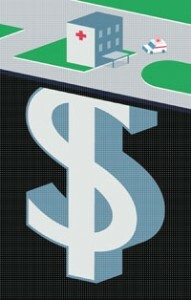 Nor from financial limitations—he was a Medicare patient, and the issue of expense was never once raised. There were no greedy pharmaceutical companies, evil health insurers, or other popular villains in his particular tragedy. 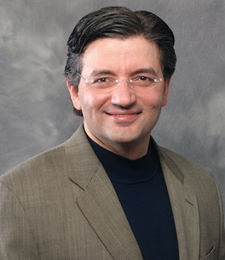 As a business executive, Goldhill is no enemy of capitalism or market-based systems. As a self-identified Democrat, he is no enemy of government. And while he may have started his year-long research effort in anger over his father’s premature death, he has produced an absorbing essay that is remarkably measured and clear-eyed. Anyone of any political stripe who cares about America’s health-care system would benefit from reading it. But health insurance is different from every other type of insurance. Health insurance is the primary payment mechanism not just for expenses that are unexpected and large, but for nearly all health-care expenses. We’ve become so used to health insurance that we don’t realize how absurd that is. We can’t imagine paying for gas with our auto-insurance policy, or for our electric bills with our homeowners insurance, but we all assume that our regular checkups and dental cleanings will be covered at least partially by insurance. Is this really a big problem for our health-care system? Well, for every two doctors in the U.S., there is now one health-insurance employee—more than 470,000 in total. In 2006, it cost almost $500 per person just to administer health insurance. Much of this enormous cost would simply disappear if we paid routine and predictable health-care expenditures the way we pay for everything else—by ourselves. The unfortunate fact is, health-care demand has no natural limit. Our society will always keep creating new treatments to cure previously incurable problems. Some of these will save lives or add productive years to them; many will simply make us more comfortable. That’s all to the good. But the cost of this comfort, and whether it’s really worthwhile, is never calculated—by anyone. For almost all our health-care needs, the current system allows us as consumers to ask providers, “What’s my share?” instead of “How much does this cost?”—a question we ask before buying any other good or service. And the subtle difference between those two questions is costing us all a fortune. Is Pro-Obama News Coverage Hurting ObamaCare? Moreover, while the press often has acted as an early-warning sign for troubled presidential initiatives, the press corp did not perk up until the public was in open rebellion. Only the most tepid questions were raised, and few hard questions about rationing and costs were posed before August. As a result, the White House was largely caught unprepared for the storm of anger and protest that greeted congressional Democrats this month. None of this is to diminish the responsibility that the president and his advisers bear for the debacle now threatening to consume the presidency. They made the decision to delegate draftsmanship to Congress. They decided to reinvent a health-care system that serves a large majority of Americans very well. They chose to conceal the costs of their plan until the CBO blew the whistle. And Obama personally and repeatedly spun nonsense (e.g., red/blue pills, bending the cost curve by spending more money, a guarantee that Americans could keep their plan while pushing a government option that would chase private insurers from the market). So the fault is the president’s. But his devoted fans in the media certainly helped. The thing I find most appalling is that the administration was intent on passing health care “reform” before the August Congressional recess… even while taking a hands-off attitude toward what should actually be in the legislation. Watching Congress pass the porkulus bill without even reading it made people nervous, but hey, the whole idea was to throw money at the economy as quickly as possible. (Ooops, they didn’t achieve even that.) Now that the focus has moved on to health care — which people passionately care about — the public appetite for radical change at breakneck speed has evaporated. You may have seen and applauded the YouTube video of Barney Frank’s verbal smackdown of a twit who accused him at a town hall of backing Obama’s “Nazi” healthcare plan. I agree that Frank’s righteous put-down was well-executed, but I have to protest the notion that anti-Obama rhetoric represents a recent coarsening of the public discourse. 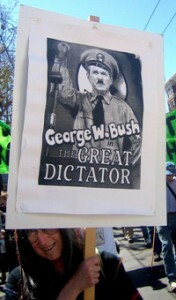 Bush=Hitler comparisons were common throughout Bush’s tenure. They got little exposure in the mainstream media — journalists recognized that the Bushitler loonies undermined more serious criticisms of Bush. But Zombietime spent years collecting photos — the two here are chosen from hundreds on his site. 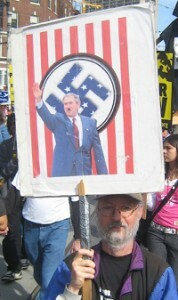 Interestingly, the young moron in Barney Frank’s audience turns out to be a member of the LaRouche cult. Lyndon LaRouche doesn’t operate on the same political spectrum as most Americans, but he is a seven-time candidate for the Democratic presidential nomination, and LaRouchians say ObamaCare is a “Nazi” policy because it does not include complete socialization of healthcare through a single-payer structure. In other words, the video shows Barney Frank taking fire from his left. My point here is not to say “the Left brought this on themselves” with eight years of Bush Derangement Syndrome. My point is that the flamethrowers on both sides of the aisle do a disservice to their own cause by distracting from more worthy arguments. Also: comparisons with Hitler should be reserved for people with eight-figure death tolls. At least when the extremist is a protester, it’s relatively easy to shrug it off. It’s a little bit harder when the inflamed rhetoric comes from the Senate Majority Leader. Update: GayPatriotWest, who is not a Barney Frank fan, has some parallel thoughts. “Evil” is a central concept for me. I named my blog about the need to fight evil. Two presidents in my lifetime have issued clarion calls about evil, and I think history may well ratify Bush’s usage as it already has ratified Reagan’s. Stalin and his legacy? Check. Iran and North Korea, the other members of the Axis of Evil? Check, check. 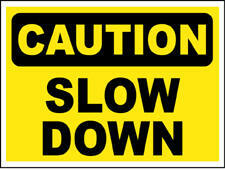 People with opposing viewpoints on health care policy? Umm…. This is the same Senator Reid who openly rooted against his own country in 2007 by declaring that “this war is lost, and the surge is not accomplishing anything.” People in high leadership positions should not indulge in partisan flame-throwing about critical issues. 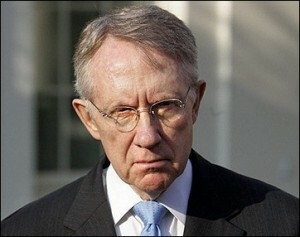 Reid’s rhetoric is disgraceful. 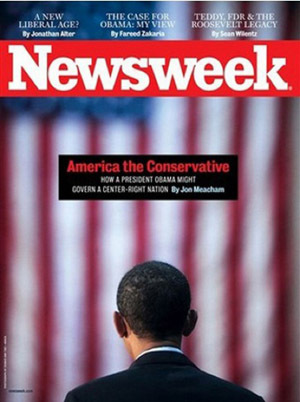 On the eve of the election last fall, Editor Jon Meacham wrote a cover story for Newsweek titled “America the Conservative — How a President Obama Might Govern a Center-Right Nation.” Predictably, he caught a lot of partisan grief for it, with one commentator calling him “conservative dittohead Jon Meacham” — an odd comment about the editor of one of America’s most resolutely pro-Obama publications. The center-right label seemed right to me at the time, even though it was clear that Obama was about to win the election. Obama’s movement toward the right, both before and after the election, has been a recurring theme on this blog. Now comes Gallup with a poll that seems to indicate that America is not just center-right as a whole, but pervasively throughout the country. 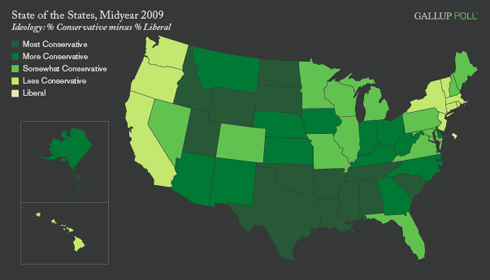 We all know that some states are more conservative than others, and the Gallup poll supports this. But the poll also found that self-identified conservatives outnumbered self-identified liberals in every single state. In three states (Hawaii, Vermont and Massachusetts), the conservative margin was small enough to be statistically insignificant — but only in the District of Columbia were liberals found to outnumber conservatives. The map below shows the relative conservative strength in each state, and as you’d expect, the most conservative states are clustered in the South and the non-coastal West. How then does it occur that Democrats control not just the White House and both houses of Congress, but also a majority of the governorships and state legislatures? Partly it reflects the fact that Republican does not equal conservative, and Democrat does not equal liberal. But I also think the poll results may be skewed because of a difference of acceptance level of the terms liberal and conservative. I have no data to support this, but it seems like the word “liberal” has become tainted in the minds of many people in a way that “conservative” has not. Some liberals choose to call themselves “progressive” to avoid the taint, while there is no similarly popular synonym for conservative. If I’m right about this, people who are somewhat left of center would be more likely to call themselves “moderate,” while people the same distance to the right of center would be more willing to cop to being conservative. The Democrats managed to ram through a porkulus bill that included hundreds of billions dollars of non-stimulative long-term spending on Democratic priorities because the country was perceived to be in an economic crisis — something had to be done now now now now now. Certainly some people across the spectrum were concerned about committing to so much spending, but hey, deficit spending is just politics as usual. The proposed health care transformation is different. Certainly our health care system is not perfect, but most Americans see that it functions pretty well in their personal experience, however much they may grumble about costs. Despite Obama’s disingenuous talk about having the insurance companies “compete” with a “public option” backed by the vast resources and regulatory clout of the government, most people recognize that no such competition is sustainable. With a public option, the corporations who currently fund health insurance for their employees will have two choices — they can continue to negotiate with insurance companies to try to get the best deal for themselves and their employees, or they can get out of the middle, stop bothering with insurance companies and just dump all their employees into the public “option.” Hmmm… decisions, decisions. People intuitively understand that the “public option” is a first step toward a single-payer world in which the government directly controls one-sixth of the economy, and has no competitive incentive to reduce costs and improve service. Some on the Right refer to this as “postalizing health care,” although that’s not really fair. Thanks to Fedex, UPS, email and the telephone, the post office has a lot more competition than a single-payer health care system would have. Maybe single-payer is the way to go. I don’t think so, but let’s have that debate. But let’s stop pretending that it’s not the direction the Left intends to head.